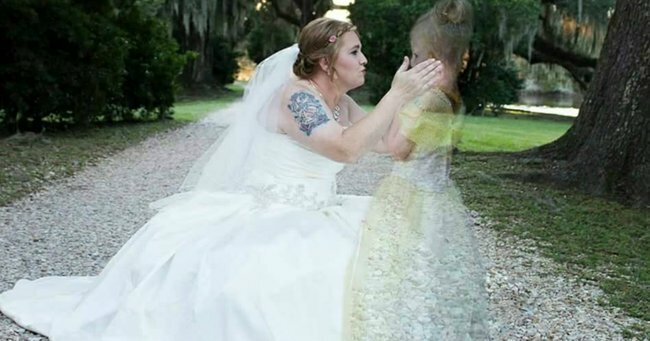 The viral wedding photos that include a young girl lost to cancer. Azalee died two years before her mother's wedding. But she appears in all the photos. Amanda Carroll Crowe lost her six-year-old daughter Azalee to cancer in 2013. And this week, when Amanda got married, she wanted Azalee to be included in the wedding. When Azalee died, Amanda hadn’t yet met her new husband, Chip. But wedding photographer Ashley Frantz had an idea how to bring the whole family into the celebration. The result? A beautiful series of images that include Amanda embracing her beloved daughter. The image, which was published by her friend and photographer on Facebook yesterday, has since been shared over 7000 times. “Finally get to share one of the most beautiful and difficult pictures I’ve ever been asked to do. This is my wonderful friend Amanda during her bridals. She wanted so badly for her precious Azalee to be there with us,” Frantz wrote online. “Azalee’s battle with childhood cancer ended 2 years ago… she went to heaven before her mommy met the most wonderful man named Chip. Heartbroken that her girl wouldn’t be here to experience this new journey with her, Amanda asked me to please incorporate Azalee into the pics somehow. This is what I came up with and I couldn’t be more pleased. It was such an honor to be able to do this for her and I’m so thankful God has given me a talent that I can use to make broken hearts just a tad less broken. The second photo in the series shows Amanda walking with her daughter on her right and another child to her left. It’s safe to say that Amanda was thrilled with the results, writing on Facebook that Frantz was able to capture “an absolutely priceless moment” of her and her daughter. “She found a way to include her in my bridal and she did it so well. God has blessed Ashley with many talents and there is no one else would have wanted taking pictures on our most special day,” she wrote.